Our auto repair shop is small enough to give us the luxury of becoming personally acquainted with you and your vehicle. The average tenure of our five employees is 18 years, so you'll be greeted by the same smiling faces each time you bring your car in. We look forward to developing a long-term relationship with you and your car! We're conveniently located just three blocks east of the University of Oregon, and offer shuttle service in Eugene and Springfield. We also have extended hours--7:45 a.m. to 5:30 p.m. - as well as after-hours drop-off and pick-up. Our check-in system is quick and efficient; and in most cases, we offer one-day repair service. We make sure you understand what's going on under the hood and exactly what you can expect from our service. We firmly believe that reasonable, informed expectations are the best way to prevent disappointment. Euro-Asian Automotive has been selected as an authorized Bosch Service Center. Bosch provides our mechanics with six one-week factory training classes in such areas as fuel injection, computer control diagnosis and anti-lock braking systems. 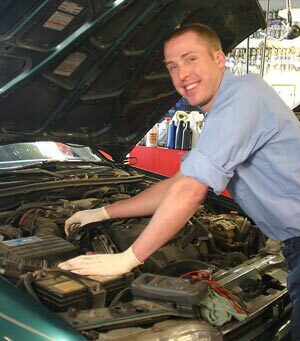 All our technicians are Automotive Service Excellence Master Techs. They also attend annual seminars sponsored by automotive parts manufacturers. Our industry changes rapidly, and we're committed to staying ahead of the curve! We have the latest Dell computer hardware with a total of 7 computer terminals located around the office and shop. They have the access to information websites for up to date info. We keep back-ups of our files off site so we will always have the records on your car. We believe you've got more important things to do than to fret about when your oil needs changing or your fan belts needs checking. That's our job, and in a matter of seconds we can review our records and tell you exactly what your car needs. Our computer even averages your auto's miles per month and figures out when you'll need a particular service. You'll get a timely reminder in the emails from us. Since 1975, Euro-Asian Automotive has carefully and consciously developed an outstanding reputation for integrity and consistently high quality service.